ANZAC services will be held in eight townships across the Waikato district on Wednesday, April 25 as well as in nearby Cambridge and Hamilton. In Cambridge, the Dawn Service will be held outside the Cambridge Town Hall, at 6am, and the Civic Commemorative Services will be held inside the Town Hall at 9am, followed by placing of wreaths at the cenotaph. Hamilton’s ANZAC services take place at the Cenotaph in Memorial Park on Memorial Drive, the dawn service at 6am, the civic ceremony at 10am. The Waikato District Council is reviewing its representation arrangements in the lead up to the local government elections next year. Local interest groups, community boards and committees are being invited to give their views at a workshop on April 23, 6-8pm at the Tamahere Community Centre. An initial proposal on representation is expected to be adopted by the council in June followed by formal consultation. The Tamahere Market this Saturday will be the place to get your feijoa rations – if you haven’t got your own personal supply of the fruit or the overflow from friends. 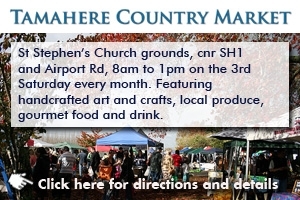 The evergreen monthly treat of fresh and cooked food, arts, crafts and all manner of novelty items is on from 8am till 1pm in the grounds of St Stephen’s Tamahere. Children can be transformed – the resident face painter will be there – and marketgoers can also help transform other lives by donating to the Foundation for the Blind via the fundraising effort of the guys with their Italian Minis. A poppy tree will again be blossoming in Matangi for Anzac Day with the red crafted flowers set to brighten more of the Waikato district than ever. In its first year in 2017, the poppy tree installation in the Jack Foster Reserve on Matangi Rd drew wide interest and acclaim. Part of a district-wide remembrance the decorations will go up again commemorating a hundred years since World War 1. Pumpkin Night, the most popular family night of the Tamahere year, is on this Saturday, March 10, 3-8pm. The night is filled with fun for kids and adults alike with food stalls, rides and other activities for kids, big pumpkin and other competitions, and entertainment. The Trenwith Boys, a talented, local and popular family band, will be setting the music scene. The Hamilton Section of the Waikato Expressway is to hold an open day this Saturday, March 3 from 10am to 2pm. A new scale model of the Southern Interchange at Tamahere will be on display in the Ryburn Rd Project Visitor Centre along with timelapse videos showing how bridges and embankments are being built. Visitors will also be able to take a free, 30-minute bus tour of the work site or watch the project’s survey drones photographing the site from the air. The indoor bowls season is about to get underway in the Tamahere Community Centre. It starts on Monday, March 5 and will continue on most Monday nights until early October. Indoor bowls is a game that is easy to learn and is suitable for all ages and abilities. Equipment is provided as is coaching for beginners. The spectacularly leafy and peaceful arboretum and sculpture park near Tauwhare is opening free of charge on Waitangi Day. It follows well-attended, free-entry days on Boxing Day and Anniversary weekend as owners John and Dorothy Wakeling share the park again and gauge interest in saving it from permanent closure. The couple believe they have almost singlehandedly created a valuable community asset from a wasteland and are keen for the park and the biodiversity that it nurtures to be secured for future generations. Music in the Meadow, a fundraising concert featuring New Zealand music royalty The Lady Killers, is being held locally on Sunday, February 11. The event, which will raise funds for Hamilton Boys’ High School rowing teams, will be on from 1pm to 6pm at 259 Raynes Rd. Main act, The Lady Killers, feature the powerful, belt-em-out vocals of Suzanne Lynch, Tina Cross and Jackie Clarke. Following the success of its ‘Best Christmas market’ in December the Tamahere Lions are sponsoring another five markets this year. More than 1400 shoppers checked out the Christmas market, many stall holders sold all their stock and there were many calls for more markets, said Lions’ spokeswoman Susan McHugh. Styled this time as the ‘Best Artisan Market’, they will be held 9am to 1pm on Saturday, April 14, June 23, August 4 and December 1. Want local news delivered to you? Heck, yes, take me to the sign-up page for the free weekly news digest. Meets on the first Monday of each month, 7.30pm, Tamahere Community Centre. Read the committee's minutes here. 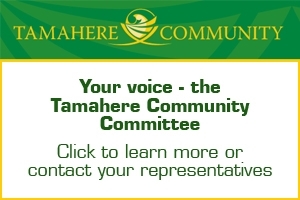 To search Tamahere Forum enter a term in the box below.